That Gilad Shalit has been released after five years of captivity by Hamas brings joy to anyone who watches the Israeli soldier's reunion with his parents and the ecstatic welcome he received by his countrymen. It also reminds one of the Israel Defense Forces' noble purpose in doing all it can to stand by its men. But joy is tempered by the bitter realities of statecraft. First, the trade of one Israeli soldier for 1,027 Arabs, 477 of them convicted terrorists, offers huge incentives for the capture of more Israeli soldiers. Second, the trade releases hundreds of terrorists to their freedom, where they can resume their evil ways, targeting not just Israelis but civilized peoples everywhere. This exchange points to the sentimentalization of strategy. Leaders who place the concerns of one individual over the interests of the country betray their mandate and poison its future. Israeli politicians have been making these lopsided swaps since 1982; over ten thousand Palestinians serving prison sentences for terrorist or other hostile actions. Each time they do, they forsake principle and common sense for short-term benefits. Shame on them. Nov. 1, 2011 update: Lest anyone imagine that the Shalit deal improves the security of Israeli soldiers, here's some information from Amos Harel in Ha'aretz on the IDF's "Hannibal Protocol," to prevent future abductions of soldiers. The Hannibal Protocol has been highly controversial since its introduction in the late 1980s, after a few incidents in Israel's security zone in south Lebanon. It allows commanders to take whatever action is necessary, even at the risk of endangering the life of an abducted soldier, to foil the abduction. The policy was suspended in the last decade due to opposition from the public and reservist soldiers. The army investigation into Shalit's abduction revealed that the commander of another tank in the Kerem Shalom sector saw two Palestinian militants taking Shalit back into the Gaza Strip and requested permission to fire at them. Radio communication problems delayed the request; permission was issued only for submachine fire from the tank, which did not stop the abduction. After Shalit's kidnapping the Hannibal Protocol was revised and reinstated. In an interview with Haaretz about two years ago, then-Nahal Brigade commander Col. (now brigadier general ) Motti Baruch said, "The message is that no soldier will fall captive, and it's an unequivocal message." Baruch instructed his soldiers, in the event of an abduction attempt, to fire on the terrorists even at the risk of hitting the abducted soldier. 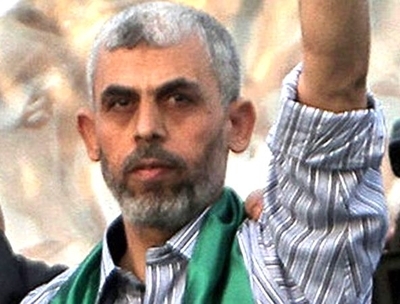 Jan. 5, 2012 update: Good news – the Israelis appear to be ready to end lopsided prisoner exchanges. A government-appointed panel submitted its recommendations in a secret report Thursday and details were not divulged. But Defense Minister Ehud Barak said Israel has "no choice but to overhaul the rules" now that Sgt. Gilad Shalit has been freed after five years in captivity in Gaza. Barak told Israel Radio, "We have to get off the slippery slope we ventured on 25 years ago." There has been a sharp increase in the number of attempted terror attacks since the release of Palestinian prisoners in exchange for captive Israeli soldier Gilad Shalit last October, according to the outgoing commander of the Binyamin division, Col. Saar Tzur. "Prison is like university for the terrorists – anyone who goes in comes out upgraded," Tzur said in an interview with Army Radio. He said that following the Shalit deal, there was a noticeable increase in the number of attempted terror attacks both in the Judea and Samaria region, which falls under his command, and inside Israel proper. "It doesn't matter whether they were released to Gaza, the West Bank or abroad – we see a return to terrorism." Raising fears about looming terrorist attacks, data compiled by the defense establishment indicate that dozens of the Palestinian prisoners who were released a year ago as part of the deal that freed IDF soldier Gilad Shalit have resumed terrorist activity. Since the deal, about which many of Israel's security heads expressed reservations, calls for kidnapping a "second Gilad Shalit" have been heard repeatedly from terrorist organizations. Though the motivation for such kidnappings existed before Shalit's release, there is no doubt that freeing 1,027 prisoners, many of whom were convicted murderers, in return for one hostage soldier, gave a meaningful push to actual attempts to create another "bargaining chip" in order to secure the release of additional prisoners. 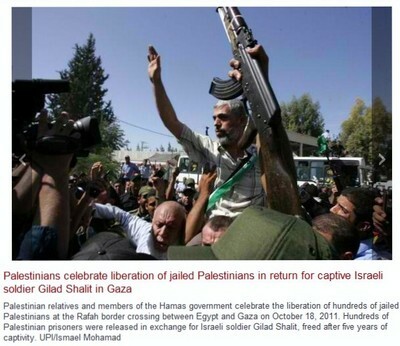 On the day of Shalit's release, October 18, 2011, thousands of Hamas operatives took to the streets of the West Bank and Gaza Strip. The slogan shouted by Palestinian youths that day, especially prisoners' family members, was that the Palestinians needed "another six Shalits" in order to empty out Israel's prisons. In some of the cases, terrorist squads were caught inside Israel, searching for a victim. Several of them had hideouts prepared weeks in advance — caches and basements built especially to hold a kidnapped Israeli. Sometimes it was only luck that prevented a murder like that of Hazan. It turns out that most of the kidnapping attempts have been orchestrated by terrorists, primarily from Hamas, who were released in the October 2011 Shalit exchange. Not the ones who were released to their own homes in the West Bank, but those who were exiled to Gaza or abroad, and are now setting up terrorist networks there, based on their connections with operatives in the field. 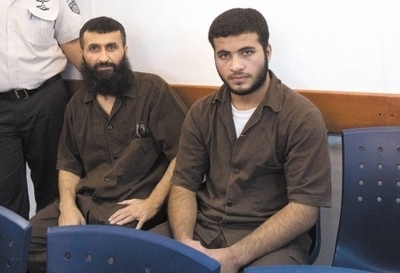 June 23, 2014 update: Another evil consequence of the Shalit deal has come to light: Ziad Awad, 42, a Hamas operative released in exchange for Shalit has just been charged, along with his son Izzedin Ziad Hassan Awad, 18, with the shooting of Policeman Baruch Mizrahi in April 2014. Ziad Awad (left) and his son Izzedine in court. In response, Economy Minister Naftali Bennett reiterated his opposition to such exchanges: "Today we need to clearly say: No more terrorists will be released. After 30 years, it's clear that Israel should not release any more terrorists, in any situation, period." July 20, 2015 update: Ahmad Najjar, a Hamas operative and suspected mastermind behind the killing of Malachy Rosenfeld, 25, and the wounding of three others on the West Bank in June 2015, was among those freed in exchange for Shalit. Rosenfeld makes the sixth Israeli killed in attacks either carried out or planned by Palestinians released for Shalit since April 2014. Najjar had spent eight years in Israeli prisons for his role in attacks that killed three Israelis. Feb. 13, 2017 update: Worsen than all the preceding assaults is the fact that Yehiya Sinwar, the brutal jihadi who was traded for Shalit, has now become the head of Hamas in Gaza.